DVDSmith Movie Backup (DVDSmith) is a DVD Decrypter and DVD Copy software, which supports copy full movie or main movie to hard disc, and remove all DVD protections (including CSS, RC, RCE, APS, UOPs and Sony ARccOS) at the same time.DVDSmith is a copy software that can copy DVD for FREE,in other words, it is a free DVD copier. With DVDSmith, users can make exact copy of original DVD for free. Making backup of your favorite DVDs, you can feel free to play copies on your hard drive, no need to insert the original ones into DVD players again and again. DVDSmith is the best solution to free you from the risk of getting your original DVDs scratched or damaged from frequently use. And the copies files are with flawless playback quality.What surprises most is that DVDSmith is a free DVD copier. 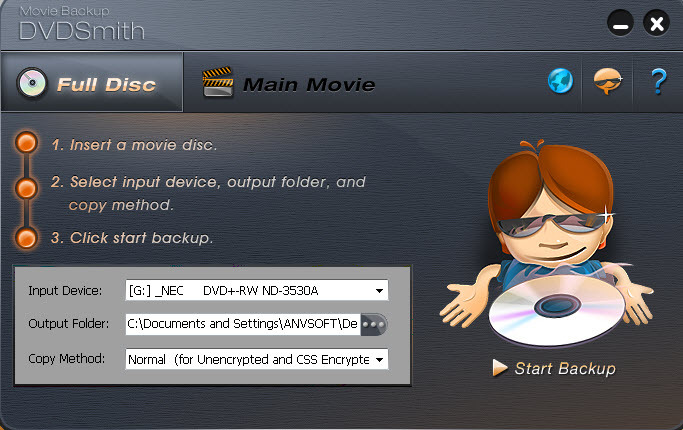 DVDSmith is a FREE Copy Software, which provides you a great solution to make backup of DVD movies. After the DVD files are made on hard drive, you could use other burning software like Nero, Roxio, Imgburn, etc. burning software to burn the files to a blank DVD disc. Or you could just download Any-DVD-Cloner, Movie-DVD-Copy, or Any-DVD-Clone, they can do the burning job for you easily! Any DVD shrink can copy DVD to DVD,including DVD-9 to DVD-9,DVD-5 to DVD-5;also can copy DVD to hard disc with output as DVD Folder or ISO Image File. Any DVD Shrink makes DVD copy in 1:1 ratio without quality loss. If two or more DVD drives are available and at least one of them is a DVD burner,it will be easy to backup DVD: DVD-9 to DVD-9 or copy DVD-5 to DVD-5 with Any DVD Shrink. If you have only one DVD drive, you can create ISO image file on hard disk for further burning from DVD-9 and DVD-5,or copy the entire DVD to hard disk as a DVD folder. ---- An all-in-one DVD ripper and video converter for your iPod, PSP, Zune, Creative Zen, Archos, Sony Walkman or any other portable media players. Rip DVD to AVI, DVD to WMV, DVD to MP4. ---- An all-in-one DVD Cloner and DVD Ripper, which can not only clone DVDs to non-protection DVD but also rip encrypted DVDs to iPod, iPhone, PSP, PS3, Xbox etc. 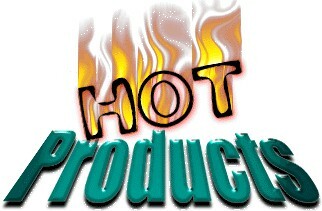 ---- An all-in-One video to DVD tool combined with video editing and DVD burning. Make your own DVD from various video formats, DV camcorder and online video. ---- An all-in-one DVD authoring tool to make DVD slideshow with background music and transition effects from pictures and videos, play on TV and PC. Keep and share precious moments with family and friends.